Browse your many options for media types, print sizes, and framing choices to make your photograph just the way you want it! 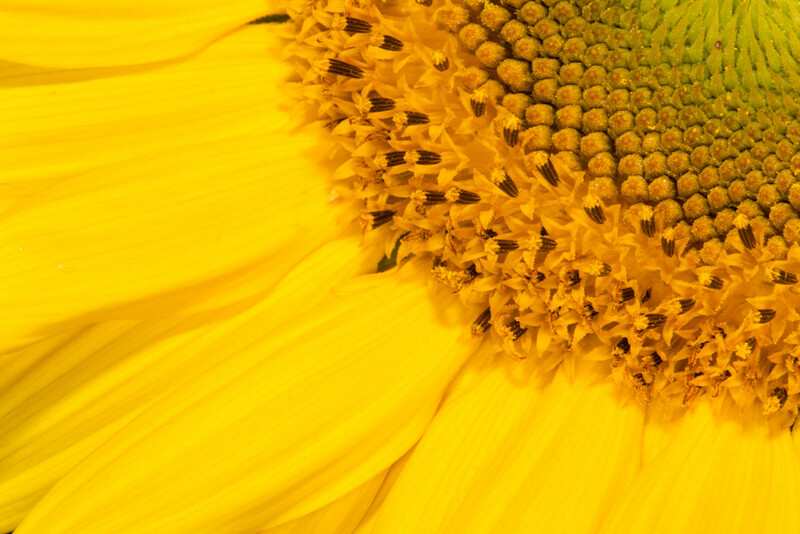 High-key closeup of a Common Sunflower (Helianthus annuus), in full bloom. This closeup view shows the outer ray flowers (which form the flower's petals) and the inner 5-petal disk flowers that produce the seeds - packed in their familiar Fermat's spiral (which produces the most efficient packing of seeds in the space available). If you're not quite ready to decide on your favorite image right now or you want to run ideas by someone else, feel free to "Save to Favorites" and "Email a Friend." Or, if you have any questions, drop me a note on my contact form or email me! Smart shopper tip: while choosing to have my images printed on photo quality paper is an economical route to classically displayed artwork, you may be interested in exploring the "ready to hang" options of stretched canvas, metal or acrylic. These beautiful choices, though initially more expensive, are equally archival as the Fine Art Paper and make a stunning, attractive ready-to-hang print that is surprisingly closely priced to matted/framed paper prints.